Rutherglen is a small town in north-eastern Victoria, Australia, near the Murray River border with New South Wales. On the 31st (Sun), do a tasting at James & Co. Wines. To see traveler tips, other places to visit, reviews, and tourist information, read Rutherglen trip itinerary maker app . Adelaide to Rutherglen is an approximately 6.5-hour flight. You can also drive. Traveling from Adelaide in March, Rutherglen is slightly colder at night with lows of 13°C. Wrap up your sightseeing on the 1st (Mon) to allow time to drive to Bright. Bright is a town in northeastern Victoria, Australia, 319 metres above sea level at the southeastern end of the Ovens Valley. 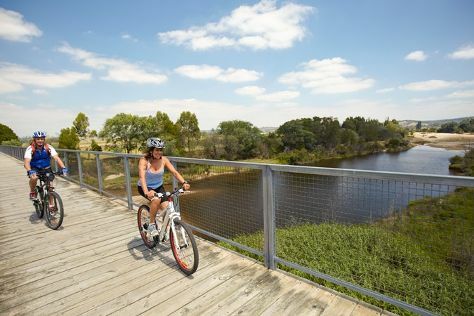 Start off your visit on the 2nd (Tue): explore the stunning scenery at Canyon Walk, then indulge your thirst for a good beer at Bright Brewery, and then let the kids burn off some steam at Howitt Park. For traveler tips, maps, ratings, and more tourist information, you can read our Bright trip planner . Drive from Rutherglen to Bright in 1.5 hours. In April in Bright, expect temperatures between 26°C during the day and 8°C at night. Finish your sightseeing early on the 2nd (Tue) so you can travel to Omeo. Omeo is a town in Victoria, Australia on the Great Alpine Road, east of Mount Hotham, in the Shire of East Gippsland. On the 3rd (Wed), steep yourself in history at Omeo Historic Park & Museum, then trek along Oriental Claims Historic Area, and then walk around Livingstone Park. For photos, ratings, reviews, and tourist information, use the Omeo trip itinerary builder app . You can drive from Bright to Omeo in 2 hours. Finish your sightseeing early on the 3rd (Wed) to allow enough time to travel to Bairnsdale. On the 4th (Thu), explore the landscape on two wheels at East Gippsland Rail Trail and then step off the mainland to explore Raymond Island. To find reviews, other places to visit, more things to do, and more tourist information, you can read our Bairnsdale tour planner . You can drive from Omeo to Bairnsdale in 2 hours. Expect a daytime high around 23°C in April, and nighttime lows around 10°C. Finish your sightseeing early on the 4th (Thu) to allow enough time to travel to Yea. Yea is a town in central Victoria, Australia 100km north-east of Melbourne at the junction of the Goulburn Valley Highway and the Melba Highway, in the Shire of Murrindindi local government area. Kick off your visit on the 5th (Fri): look for all kinds of wild species at Yea Wetlands, then sample the tasty concoctions at Yea Winery Cidery and Brewery, then look for all kinds of wild species at Y Water Discovery Centre, and finally steep yourself in history at Cheviot Tunnel. To find out how to plan a trip to Yea, use our trip itinerary maker. Traveling by car from Bairnsdale to Yea takes 4.5 hours. In April in Yea, expect temperatures between 24°C during the day and 8°C at night. Finish your sightseeing early on the 5th (Fri) so you can travel back home.